Doc's Talk: Supreme Court Justice–Elena Kagan–is Pro Sharia Law! Just when you thought all the talk about Barack Obama usurping the Constitution to bring the United States into compliance with the UN and the Sharia-dominated New International Order was little more than right-wing conspiratorial propaganda—Think Again! The “Appointed One,” in cunning Islamic style, is covering all the bases by laying the foundation, including placing an ally in the United States Supreme Court! Why is it always after the fact, after the elections and after critical appointments that the real vetting of candidates finally takes place? Simple. When you have a clueless, apathetic and disengaged American populace, coupled with a leftist liberal media that’s already in the tank for the “Messharia,” you take the fast track to confirmation and worry about the repercussions later. After all, it’s a lot easier to select than it is to eject a political appointee. Elena Kagan’s views render her the first Supreme Court Justice who actively favors the introduction of Sharia law into national Constitutions and legal systems. It’s unprecedented in American history. We now have a liberal, pro-Sharia justice sitting on the highest court in the land. And is it any wonder? After all, as Obama’s Solicitor General, it was Kagan who blocked as many as nine lawsuits from being heard by the Supreme Court. Although the nine cases listed on the high court’s docket had nothing to do with Obama’s eligibility issues, there is no arguing Kagan’s advocacy for Islamic rule and Sharia Law as evidenced below. What do you want to bet that she refuses to recuse herself on any Sharia-related decision and instead leads the charge to legitimize Sharia law in America? Christine Brim of the Center for Security Policy summarized Kagans’ 2003-2009 career as Dean of Harvard Law School in the following five points. They tell the story of Elena Kagans’ “deep appreciation” of Sharia law. With Kagan’s direction, Harvard’s Islamic Legal Studies Program developed a mission statement dedicated “to promote a deep appreciation of Islamic law as one of the world’s major legal systems.” That mission statement guided her actions and those whom she directed as Dean. Under Kagan’s direction, her chief of staff at the Islamic Legal Studies Program aggressively expanded non-critical studies of Sharia law – fulfilling her mission “to promote a deep appreciation of Islamic law.” In 2003, the year Kagan became Harvard Law School Dean, Islamic Legal Studies Program Founding Director Frank Vogel and Associate Director Peri Bearman founded the Massachusetts-based International Society for Islamic Legal Studies. In 2007, Bearman and Vogel founded the Islamic Law Section of the Association of American Law Schools. When Saudi Prince Alwaleed bin Talal offered $10 million to New York City’s Rudy Guiliani on October 11, 2001, Guiliani refused to accept it, because the prince insisted that U.S. policies in the Middle East were responsible for the 9/11 terrorist attacks. Guiliani stated, “There is no moral equivalent for this act.” But, when Saudi Prince Alwaleed bin Talal offered $20 million to the Islamic Legal Studies Program in December 2005 – Kagan accepted it; after all, the Saudi royal family had funded the program since its inception to establish the moral and legal equivalency between Sharia law and U.S. Constitutional law. As presidential candidate, Newt Gingrich, has noted, Harvard Law School currently has three chairs endowed by Saudi Arabia, including one dedicated to the study of Islamic sharia law. In 2001 Guiliani made a decision not to accept Talal’s blood money. But in 2005, Kagan made a decision not just to accept it, but to implement Talal’s policies at Harvard. Not only there, but as reported earlier this year, “Kagan is the main reason why the Supreme Court ruled against the 9/11 families” in a suit filed by thousands of 9/11 family members that traced funding for the 19 hijackers to certain Saudi royals, along with banks, corporations and Islamic charities. Kagan, as Obama’s Solicitor General, said in her brief “that the princes are immune from petitioners’ claims” and that the families’ claims that the Saudis helped to finance the plots fell “outside the scope” of the legal parameters for suing foreign governments or leaders. So Kagan actively solicited Saudi financing to promote Sharia law in the U.S., and she actively protected Saudi financial backers for terrorism against the U.S., as being immune from claims by 9/11 families. In December, 2006, Kagan hired Noah Feldman, architect of Iraq’s Constitution requiring Shariah, as a star faculty member at Harvard Law School. On March 16, 2008, Feldman published his controversial article “Why Sharia” in the New York Times Magazine, which promoted “Islamists” – the Muslim Brotherhood – as a progressive democratic party, and promoted Sharia as a model not just for Muslim-majority countries but for all: “In fact, for most of its history, Islamic law offered the most liberal and humane legal principles available anywhere in the world…” The article was adapted from his book The Fall and Rise of the Islamic State, which was published in late March, 2008. In summary, Kagan made the decision to honor Feldman, author of “big-lie” forms of pro-Sharia propaganda, supporter of the Muslim Brotherhood, with an endowed chair. Feldman states flatly that the Muslim Brotherhood, whom he admires, does not “eschew the use of violence against those whom it defines as invaders in Iraq and Palestine.” Kagan’s financial backer, Saudi Prince Alwaleed bin Talal, insisted that the U.S. policies in the Middle East (specifically in Israel and Palestine) were a cause of the 9/11 attacks. Like the Muslim Brotherhood, the prince did not “eschew the use of violence” against the U.S. And when 9/11 families sued the Saudi royals who funded the September 11, 2001 “use of violence” against the U.S., Kagan used her power as Solicitor General to protect the group that had been her financial backers at Harvard. On May 1, 2007, Kagan initiated a lecture series on Sharia Law, named for Abd al-Razzaq al-Sanhuri, a legal scholar who had drafted constitutions throughout the Middle East between the 1930s and 1960s. There are literally dozens of legal reformers throughout the Muslim world that she could have chosen; but she chose al-Sanhuri. Sanhuri’s career consisted primarily of making sure that the civil and criminal legal codes throughout the Middle East were Sharia-compliant. He drafted the laws that ensured Sharia law took precedence over secular laws. As much as any single individual, he was responsible for the legal drafting for the “Constitutionalization” of Sharia in previously secular Muslim-majority nations in the 20th century, in concert with the political pressure for Sharia by the Muslim Brotherhood, and the financial pressure for Sharia by the Saudi Royal Family. 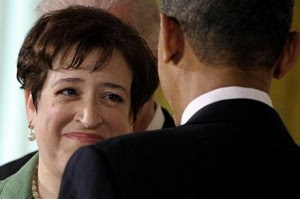 Kagan consistently used her position at Harvard to promote and legitimate the introduction of Shariah provisions into national constitutions, and indeed into Supreme Courts of other nations. In Pakistan however, her influence is having dire consequences . . .
On November 19, 2008, Elena Kagan presented the Harvard Law School Medal of Freedom to Iftikhar Chaudhry, the controversial Chief Justice of Pakistan. Chaudry had been deposed from his post in 2007 by President General Pervez Musharraf in a complex dispute that included the issue of independence of the judiciary. Musharraf later resigned, and on March 16, 2009, the Prime Minister Gilani re-appointed Chaudhry as Chief Justice. Given the fact that Elena Kagan is only fifty years old, she could easily serve on the Supreme Court until she’s eighty or beyond. Coupled with Obama’s Muslim upbringing, his anemic support for Israel, his lack of desire to secure the southern border, the ramrodding of Obamacare against the peoples will, joining an international lawsuit against the state of Arizona, his allegiance to Saudi oil magnates, his support of the UN’s Small Arms Treaty, his cosponsoring of a UN bill with Egypt to restrict free speech, the recent corrupt— Operation Fast & Furious, the appointment of his personal minions (czars) and rash of executive orders to circumvent the Constitution, and his latest gaff—resuming talks with the Muslim Brotherhood and the Taliban terrorist organization, is it even a question that the “appointed” one, the “Messharia” to America is laying the groundwork for gradual socialist reform and a syncretism of the Constitution of the United States with the Constitution of Sharia Law? I rest my case! Comment: Elections have direct consequences, this blog and others has warned the consequences of an Obama Administration. Our primary concern has been the people, up to 5,000 unelected Administration workers, who Obama had surrounded himself with as he approached the WH. Well, this person is one of many who will fundamentally devalue our traditional American values and replace them with Islamic principles. This is not a CT rather it is built upon fact-simply do your homework as we have done. Get busy now or loose what you have had the privilege of living in up to this point in your life. Is a 'Little Bit of Sharia' Okay? High Noon at Migron: Will the Bulldozers Roll In?